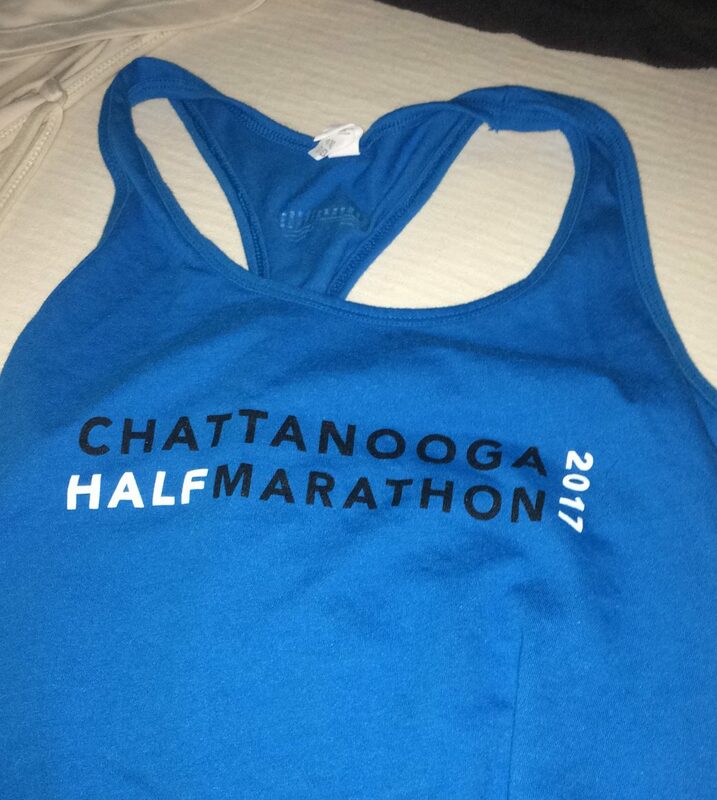 When I ran the Chattanooga Marathon, I crossed the finish line, got my water, beer and a bite to eat, then I decided to buy a couple items from the event store. It was a bit chilly, and I’ve been in need of a new sweatshirt, so I found the the correct size but realized I was a the table for the half marathon sweatshirts. As I walked to the table with the marathon sweatshirts, I spotted a cute tank top that I liked; it was perfect for training, and I am always in need of fresh, new running clothes. Many of mine can – and should – be retired at this point. No amount of washing them helps anymore. I found my size and looked to see that it said ‘marathon’ on it, then I headed to the sweatshirts, planning to pick up the tank after I found the right sweatshirt. This meant I had to dig through and find the one that was in my size AND said ‘marathon’ on it. Sweatshirt on my body (it was chilly after the race! ), I walked past the display with all the tanks, grabbing my size tank from a shelf, and headed to the checkout. Purchases made, I went to my room and packed my new purchases. Fast forward another week. I am back home and having just unpacked from my week away, I start washing and folding my laundry. I get my new tank top from the marathon, and I notice something. Something that makes me realize I suffered from what I am now calling ‘runner’s brain’ when I made this purchase. After so diligently ensuring that I picked up the correct sweatshirt, I went and completely forgot to check my tank! I guess after you work hard at a race, you aren’t firing on all cylinders. Funny enough, when I was originally looking at the tanks, I did look at the marathon ones; however, I picked my tank up from the other side of the display. Silly me. Now every time I wear this tank, I have a little chuckle at my mistake. At least I got the right sweatshirt. And yes, I wear it with pride. Have you run a race then completely had runner’s brain? Tell me about your crazy ‘oops’ moments while you enjoyed that post-race euphoria. I really want to hear them. Mostly because I don’t want to be the only one who does these kinds of things. Uhm, you were with me in my post first marathon race euphoria. I had such runner’s brain I could barely remember how to walk or eat or move much at all. I’d just take a marker and write +13 on that one. True! I also develop that fog from miles 21-25. I don’t really remember them. Like at all. Somehow, I pull out of it to enjoy the final 1.2 mi. Apparently it hits again after crossing the finish line!